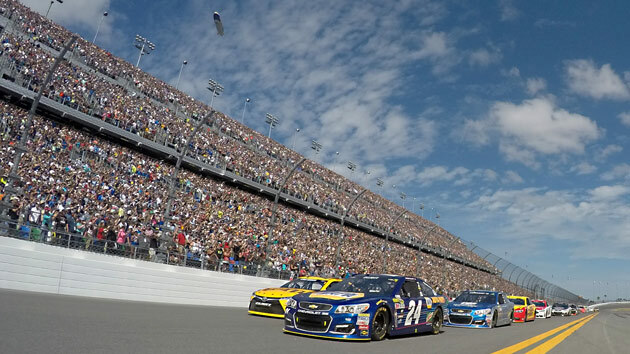 SI.com racing writer Andrew Lawrence was at Daytona International Speedway filing frequent dispatches from today's Daytona 500. 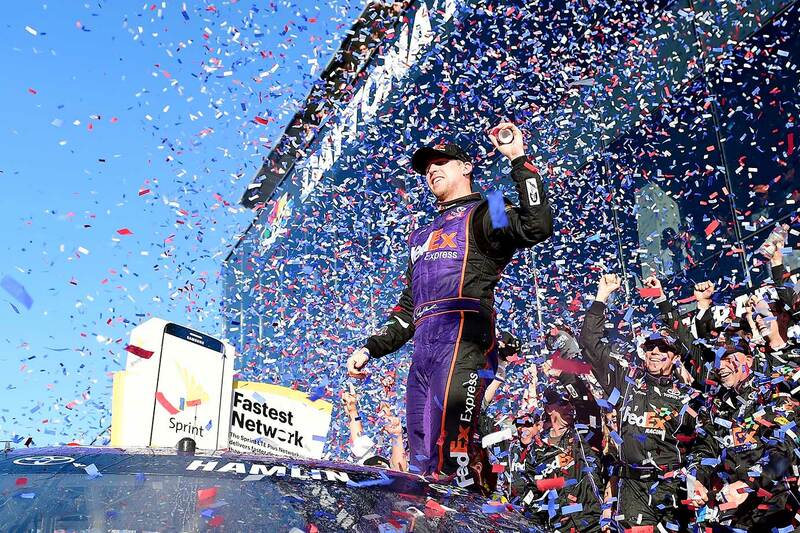 DAYTONA BEACH, Fla. — What a massive moment for Denny Hamlin. Not that long ago, he was laid up on the couch with a surgically repaired ACL—the result of a pickup basketball game gone awry. 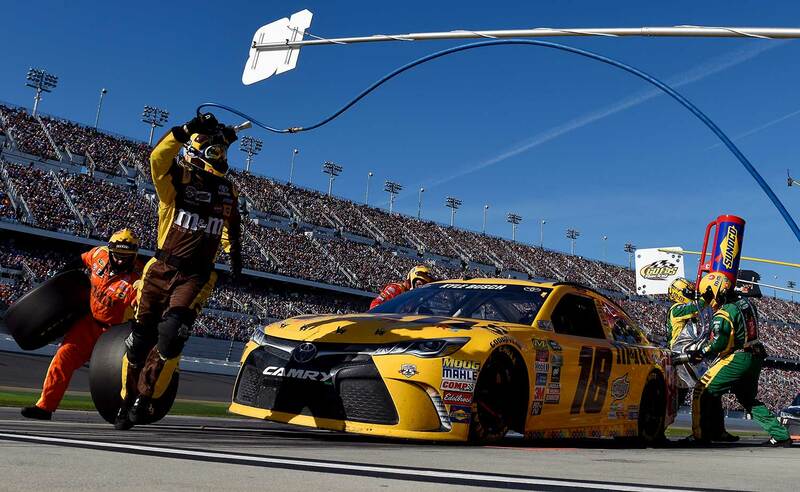 Now he has not only recorded maybe the most exciting finish since the end of 2014 Chase, he's snapped Joe Gibbs Racing's two-decade losing streak at the Daytona 500. What's more, he's the first driver to book a place in the 2016 Chase. Last year the Gibbs cars got on a heckuva streak. Kyle Busch (who finished third today) and Matt Kenseth (who led much of the race but ultimately fell to 14th) alone combined for 10 wins. However, Hamlin, the ranking pilot at the JGR shop, was a modest contributor to that success, adding only a regular-season win in the March race in Martinsville and another in the Chicago Chase race. 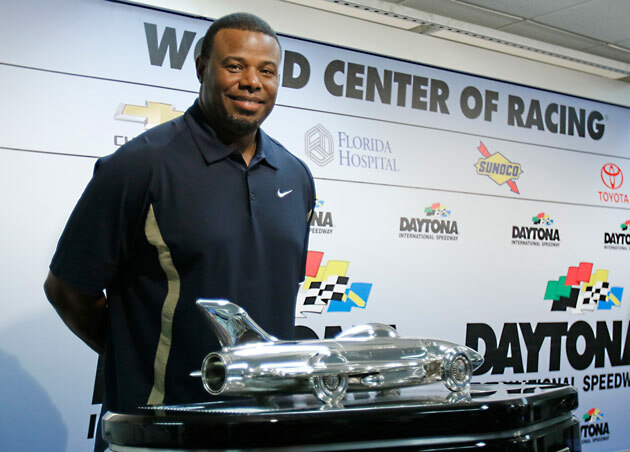 But with this five-star victory at Daytona, the closest in the the Great American Race’s 58 runnings, he seems ready to go on a tear of his own. I live blogged the race, so if you're just checking in, head for the bottom and read your way back up to see how it all unfolded. Denny Hamlin celebrates after winning his first Daytona 500, a race that had the closest finish in Daytona 500 history. Denny Hamlin moved from fourth on the final lap to overtake Martin Truex Jr. 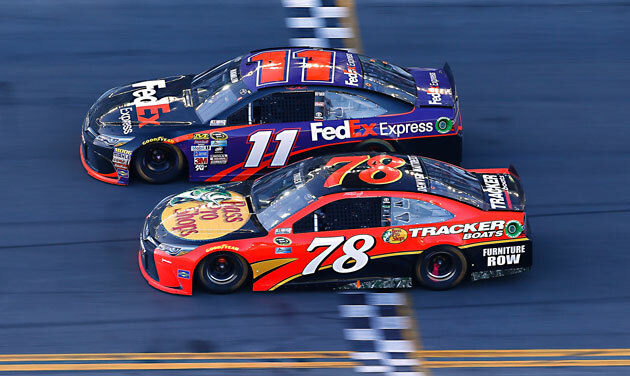 Led by Denny Hamlin, Toyota's took first, third and fifth in this year's Daytona 500. 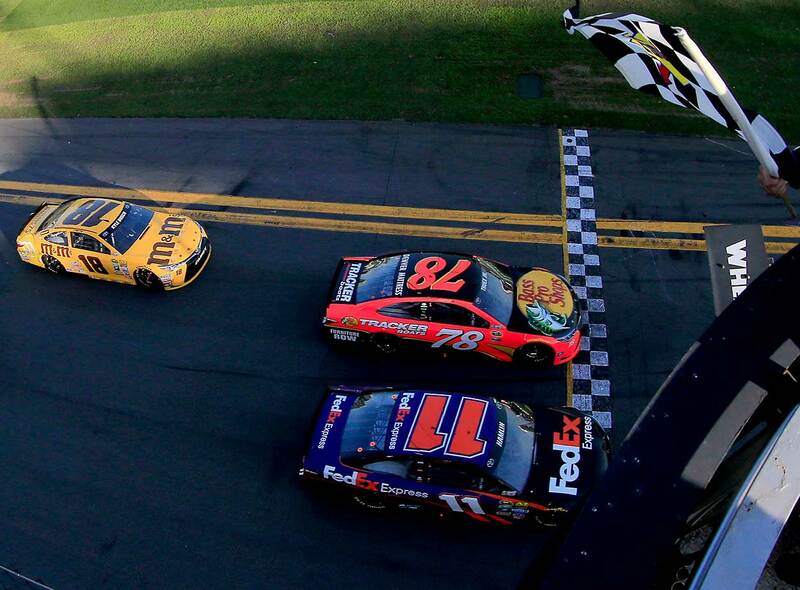 Denny Hamlin takes the checkered flag ahead of Martin Truex Jr. in the 2016 Daytona 500, the closest finish in the history of the race. 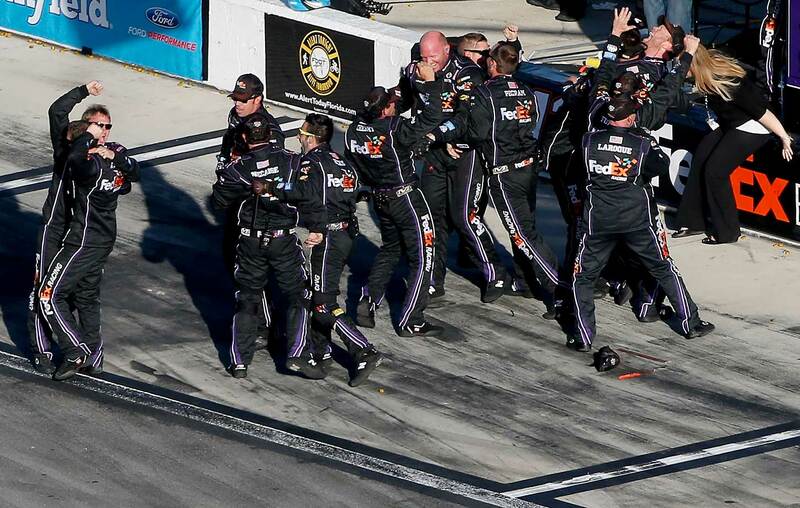 Crew members of Denny Hamlin were ecstatic after realizing he had won a photo-finish Daytona 500. 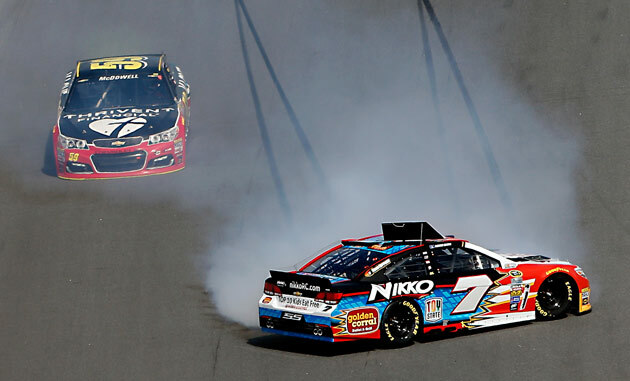 Matt Kenseth (top left) failed in his attempt to block Denny Hamlin (11) and faded from second to 14th in the final moments. 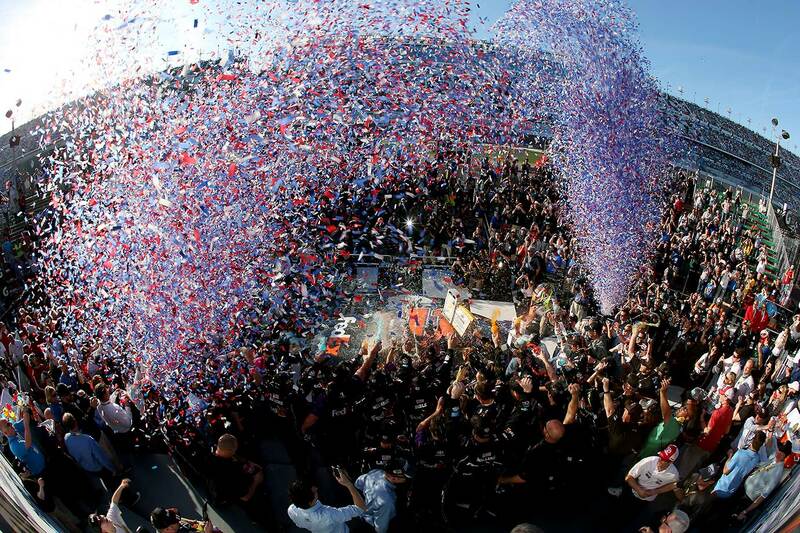 Denny Hamlin celebrates in Victory Lane after giving Toyota it's first Daytona 500 victory. 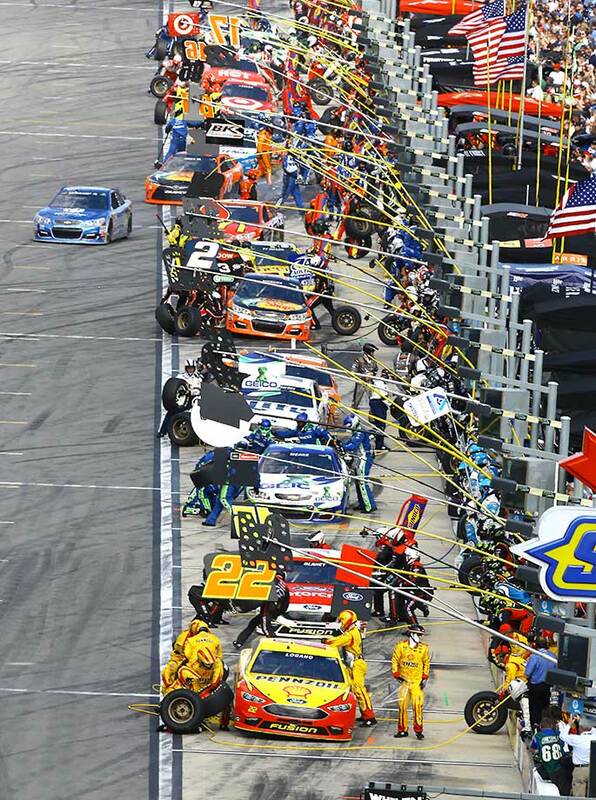 Crew members perform pit stop during the Daytona 500. 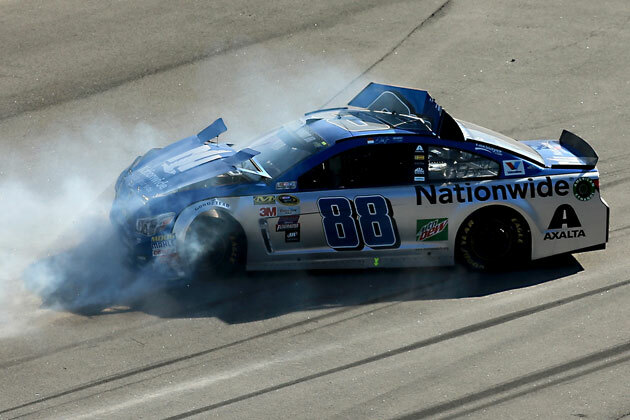 Race favorite Dale Earnhardt Jr. looses control of his car in the waning laps. 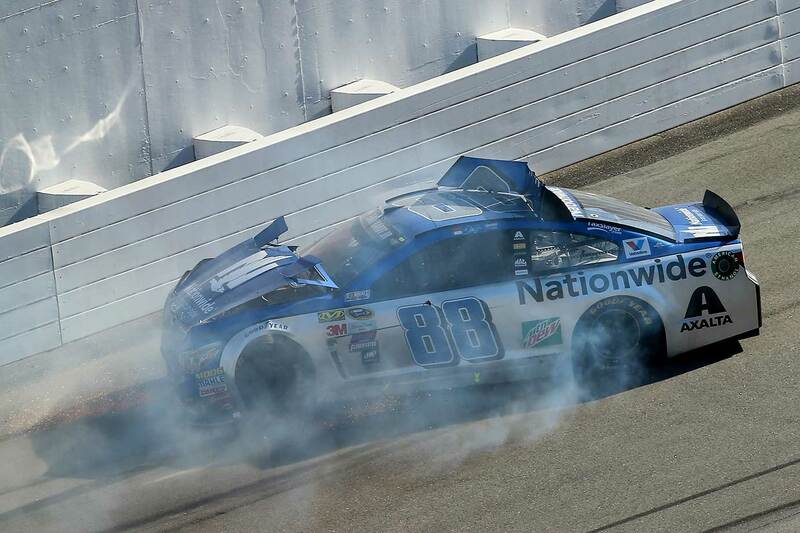 Dale Earnhardt Jr. hits the wall at the Daytona 500. Chase Elliott spins in the grass of the front stretch. 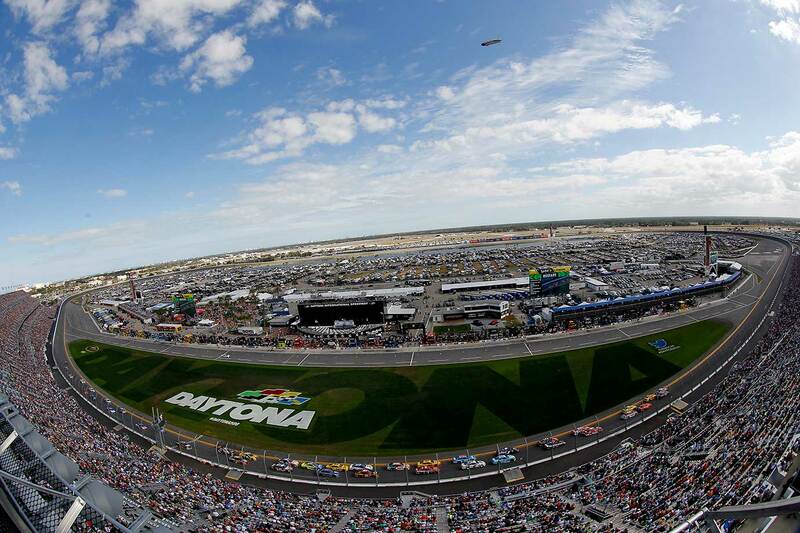 The weather was great for this year's Daytona 500. Kyle Busch pits on a day in which he would finish third. 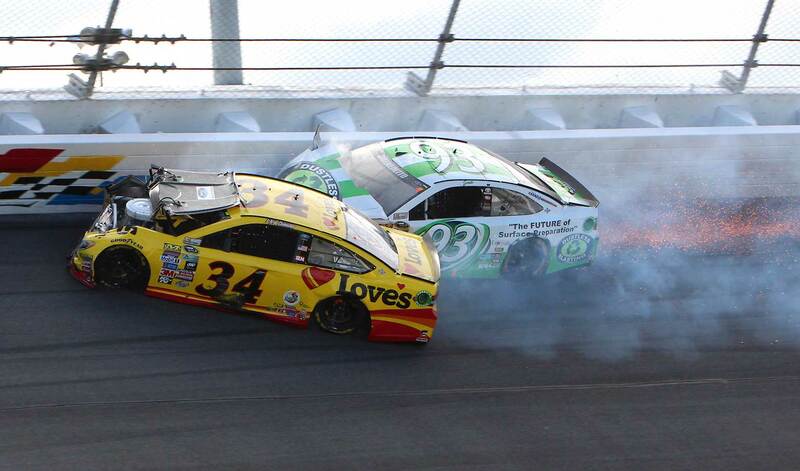 Chris Buescher (34) and Matt DiBenedetto crash during the Daytona 500. 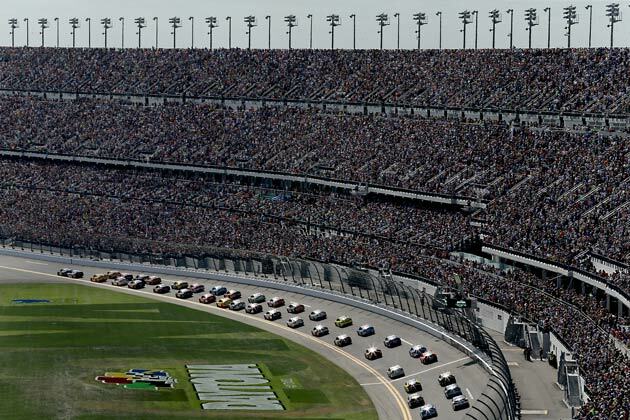 A general view of the speedway as cars race during the Daytona 500. 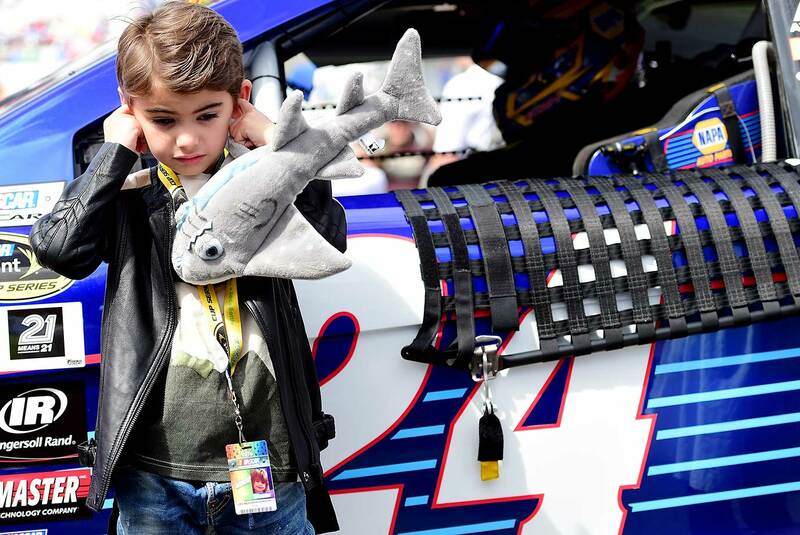 Leo Gordon, son of Jeff Gordon, stands on the grid prior to the start of the race. 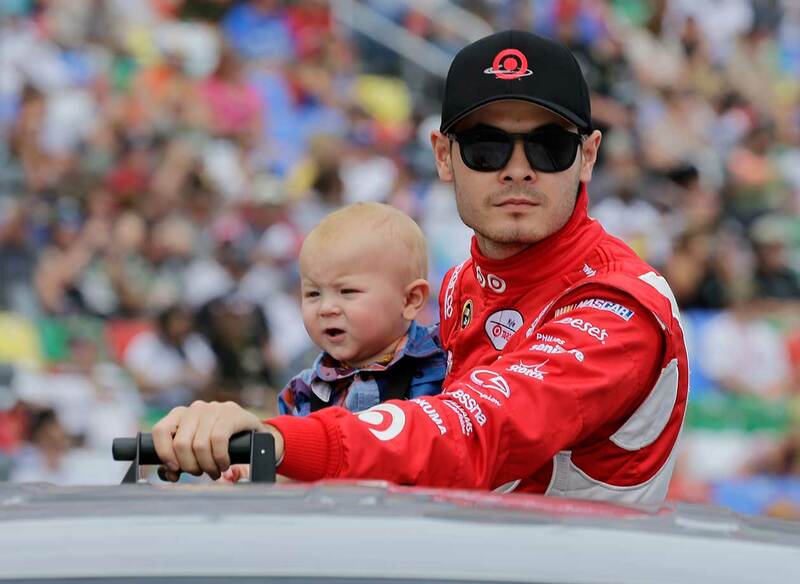 Kyle Larson, with his son, is introduced before the Daytona 500. Charlotte McKinney, John Cena and Gerard Butler at the drivers's meeting before the start of Sunday's race. 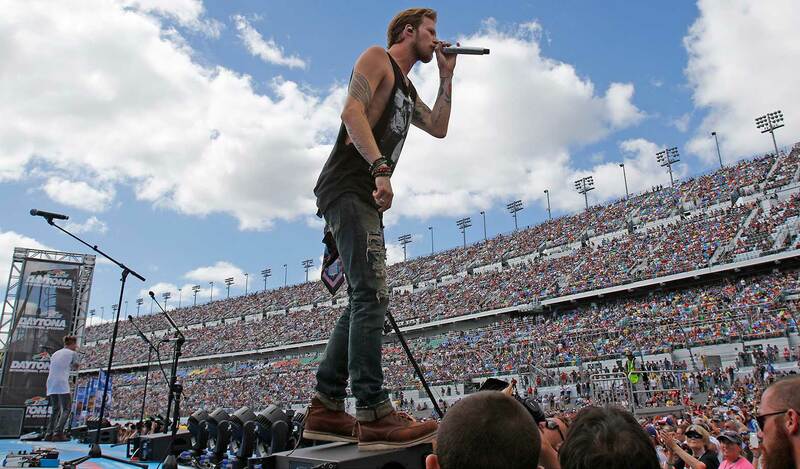 Tyler Hubbard of Florida Georgia Line performs before the Daytona 500. 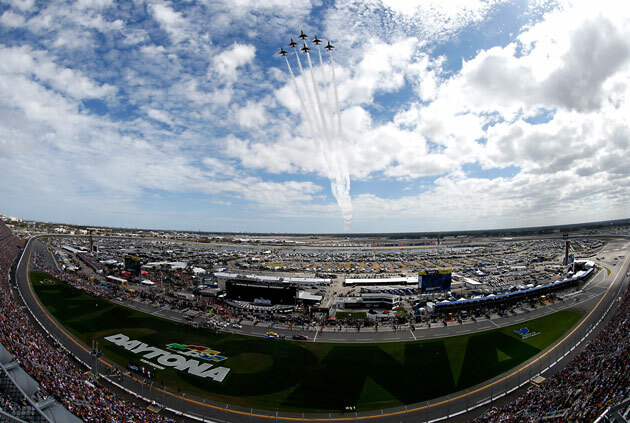 A general view of the speedway during the flyover prior to the Daytona 500. 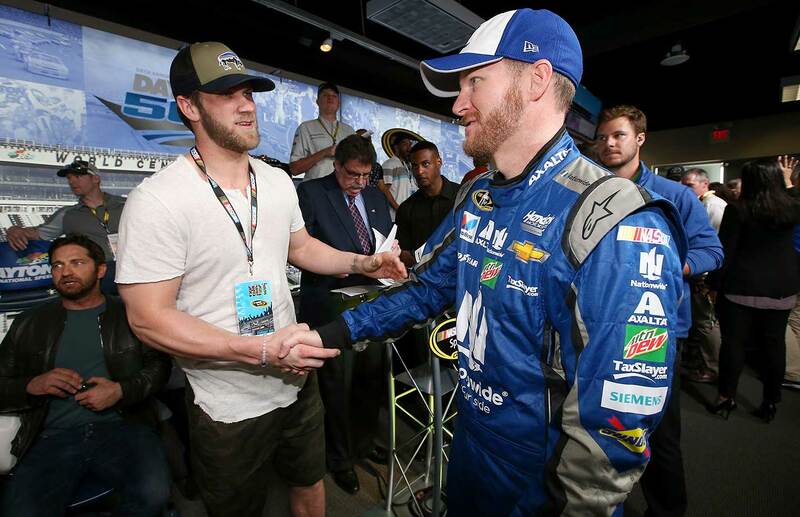 Bryce Harper talks to Dale Earnhardt Jr. at the drivers's meeting. 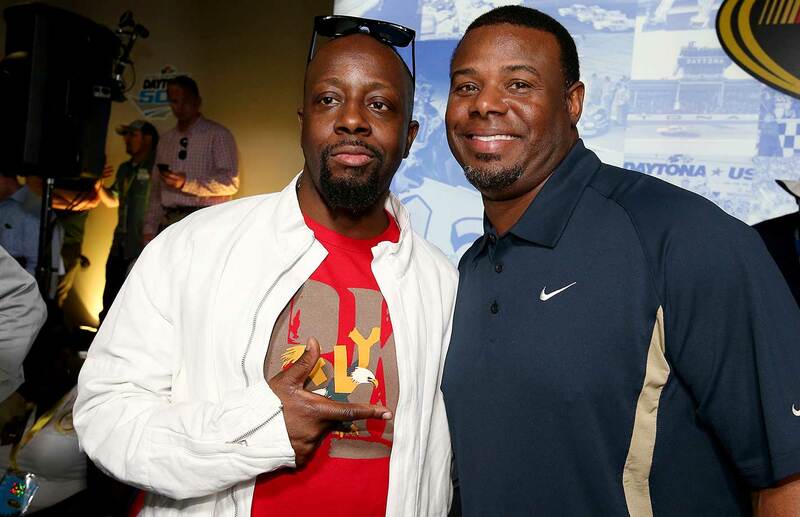 Wyclef Jean poses with Ken Griffey Jr. before Sunday's race. 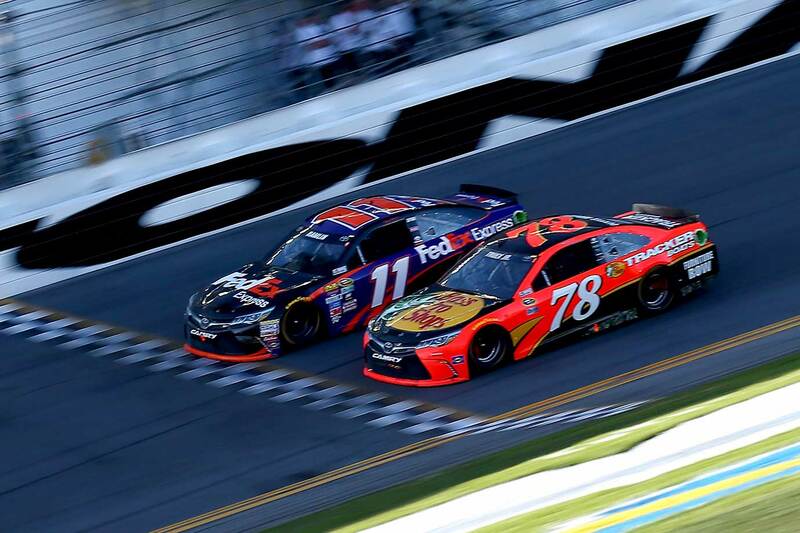 4:44 p.m.: Denny Hamlin wins what appears to be the closest Daytona 500 finish ever ... four inches ahead of Martin Truex Jr ... what a late move! With one lap to go, leader Matt Kenseth screwed himself trying to block Hamlin's charge at the top and faded from the front. That opened the door for Truex, who clung to the bottom but Hamlin kept charging and, side drafting door to door, just beat him across the line in a photo finish. Unofficial margin of victory is .011 seconds. Wow. Kyle Busch finishes third with Kevin Harvick fourth and Carl Edwards fifth. Complete order of finish is here. 4:39 p.m.: Matt Kenseth has led the last 32 laps...he's seven away from the checkers...And out of the ashes comes Carl Edwards—"still wounded," the No. 18 team declares—up to seventh place, his right front end, blackened over by so many repairs, flapping in the breeze. Wouldn't be surprised if the strategy is for him to hold up that bottom line to free up the leading Toyotas to decide this race among themselves. 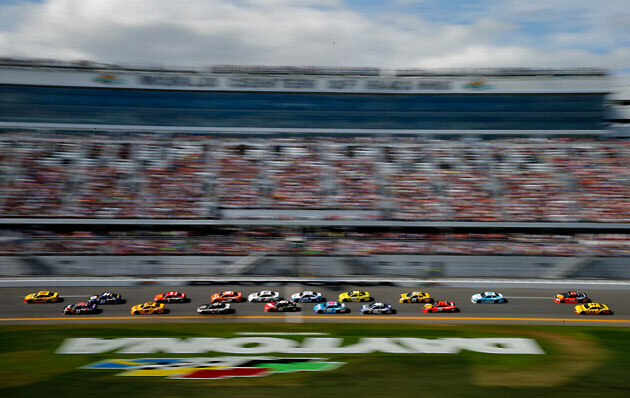 The only threat that's left to neutralize is Joey Logano, who's in fourth and leading the top line—which his teammate Brad Keselowski is trying to turn into a middle lane. 4:33 p.m.: 14 laps to go. Scene that might only be interesting to me: Greg Biffle and Danica Patrick started on the race in the same row and, thusly, were introduced together at the beginning of the race. Even then Patrick seemed extra eager to deny Biffle, charging out of the gate toward the stage before his name had been called. 4:31 p.m.: Danica Patrick skids off and hits the grass so hard, the front end of her car breaks clean off. 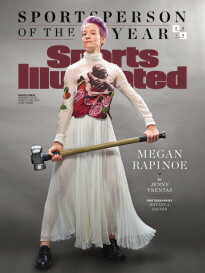 Suffice it to say, her race is over. This happens right after she attempted to shut the door on Greg Biffle, who incurred some damage but seemingly not so much that he won't be able to finish. 4:27 p.m.: With 16 laps to go, Greg Biffle clips Danica Patrick and we have our sixth caution. 4:21 p.m.: 21 laps to go. 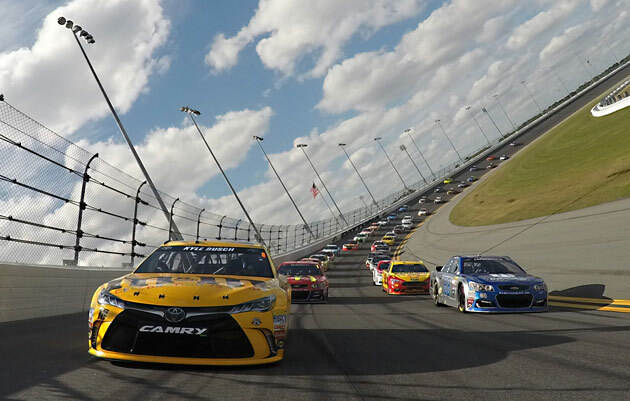 Matt Kenseth leading with Kyle Busch and Martin Truex Jr. dueling for the second and third spots. Brian Vickers sticking his nose in there. Everyone starting to make their moves. 4:19 p.m.: 26 laps to go. Dale Jr. checked out and cleared. Admits that he and his crew "underestimated" how crucial handling would be today. 4:17 p.m.: 27 laps to go. Three crashes in Turn 4 today: Chase Elliott, Brian Vickers and Dale Jr.
4:11 p.m.: With 29 laps to go, Dale Jr. tries to make a bold move and it costs him. He spins out, hits the inside wall, and is sitting in the infield now. His day is done. We have our fifth caution. 4:09 p.m.: Remember Brian Vickers? That Stewart-Haas sub who was last seen skidding up the track? He's up to fourth now. Hats off to his pit crew for keeping him in the game, which is about to get really interesting. We've officially reached the point in the race when allegiances start to break down. Case in point: Junior gets aggressive going into turn four and skids clean off the track and into the grass. And right as his commercial played over the FOX broadcast. 4:06 p.m.: 36 laps to go. 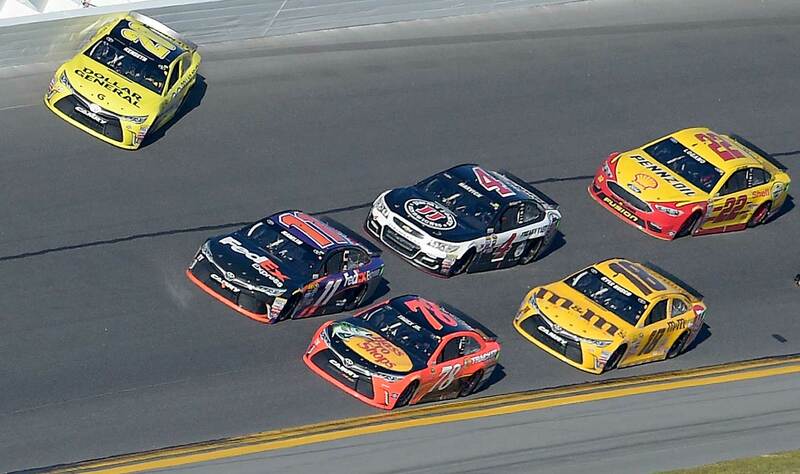 And lookie, lookie, it's Matt Kenseth in the lead. Just as the No. 18 team predicted, he caught up. Denny Hamlin's taking four tires left him in the eighth. Meanwhile, five cars were black flagged for pit road violations—at least three that I can count for speeding. I wonder if that the digital dash, one of many New for 2016 changes that have forced drivers to adapt on the fly, is the culprit. 4:03 p.m.: The biggest loser in this pit sequence is Jimmie Johnson. His crew came over the wall too soon, which means he'll go back to the pack—again—and fight his way through. He'll have company: Danica Patrick, who had picked her way into the top 10, was hit with the same penalty. 4:01 p.m.: More on Joey Logano: He is really getting wooly coming out in and out of Turn Four, which has been a bear all day. With each swing out of line, you can almost hear those first notes of the Jaws theme playing—as if signaling the coming of The Big One. Fortunately the pit stops averted the crisis. 3:56 p.m.: Under 50 laps to go now. Denny Hamlin leading. 3:52 p.m.: 147 laps complete. Denny Hamlin leading Martin Truex Jr. and Kyle Busch. 3:47 p.m.: Denny Hamlin in front now as we are in lap 128. 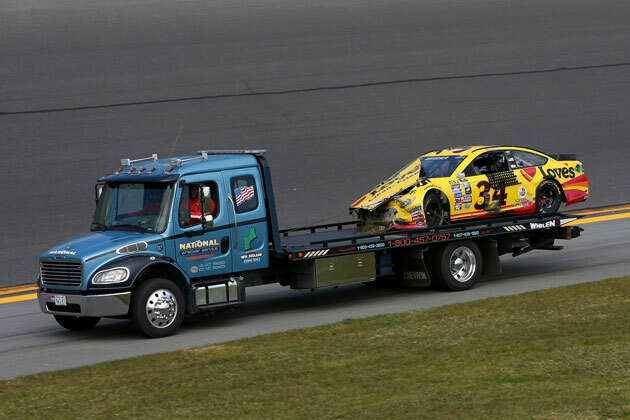 Logano and the outside line really fell back fast. Logano now 14th. If I'm interpreting the reports from the No. 18 car team correctly, the grip on the bottom line is eroding and the top line is coming into play. 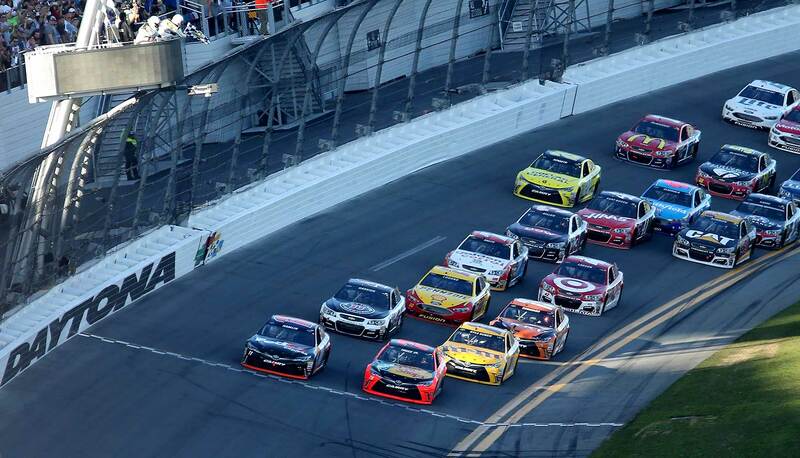 Many of the cars who were running in the train behind the Toyotas (Logano, Kurt Busch and Kevin Harvick) and are popping up to the top and making their own way. 3:42 p.m.: 65 laps to go. Joey Logano takes over the lead of the top lane followed by Jamie McMurray, who is quietly having a strong day. He must've had a good breakfast. Yesterday, I rode along with the former Daytona 500 winner as he delivered McMuffins and hashbrowns to infield gate attendants. 3:37 p.m.: Matt Kenseth was the unlucky loser in that sequence, dropping to 13th after he was boxed in by Regan Smith while attempting to peel out of his stall. No worries, radios Adam Stephens, the Gibbs crew chief for Kyle Busch. "He'll catch up." 3:35 p.m.: 125 laps down. The Toyota cars stick with the two-tire (left side) strategy. The order on the restart is Denny Hamlin and Martin Truex, Jr. then Jamie McMurray and Joey Logano—who picked up seven spots in the pits. Take a bow, Team Penske. 3:27 p.m.: Lap 120 and we have our fourth caution. Greg Biffle, who took over the lead of the top line from Kasey Kahne (now in 10th place), loses steam. Looks like a blown right rear tire is the culprit. Kyle Busch's spotter is warning his driver to watch out for debris. 3:24 p.m.: An addendum to my earlier observation about Martin Truex Jr.: ALL the Toyota cars went with a two-tire strategy on that last pit stop, anticipating that the tackiness will meet their level as the trackside temperatures start to dip with the sun. Chris Buescher is done for the day. 3:07 p.m.: Almost ready for green. Track still being cleared of debris. Dale Jr. is 11th now after leading 15 laps early on. Has had his car's chassis adjusted twice as he tries to improve his handling. Has complained of not enough downforce. 3:05 p.m.: 98 laps complete with 12 lead changes so far. The leaders have dived into the pits. Denny Hamlin will restart as the leader, followed by his Toyota confederates from Gibbs Kyle Busch and Matt Kenseth) and Furniture Row (Martin Truex Jr.). 2:56 p.m.: Third caution of the day Matt DiBenedetto and Chris Buescher get loose in Turn One, both hit ht wall. DiBenedetto is out of his car but limping. Buescher is woozy but also out under his own power. 2:52 p.m.: 86 laps. The No. 18 car radios the spotter to report debris on his front end. Nothing serious, he says, but worth keeping an eye on. Drivers still coming to grips with the handling issues. 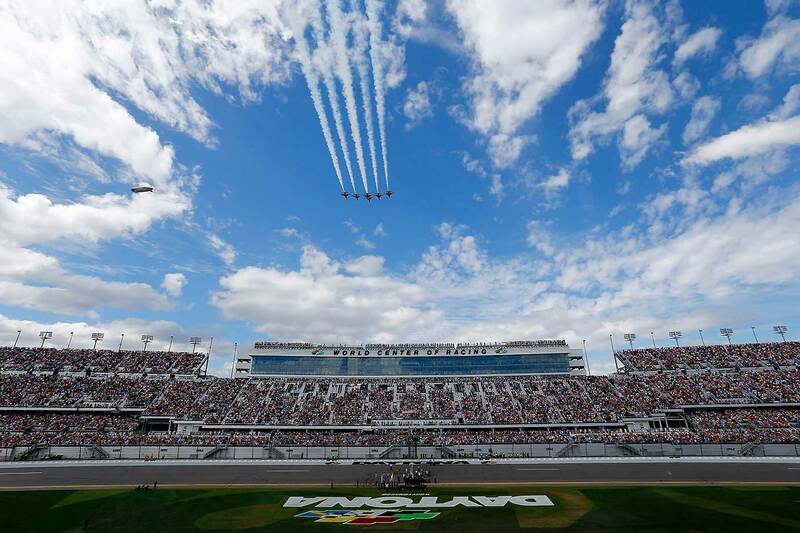 Often cited as that they race and practice in the evening during Speedweeks, so when they run the 500 on a hot, sunny afternoon the conditions are very different. 2:46 p.m.: 82 laps complete. Jimmie Johnson, in the top lane, drops off the lead dramatically as the Toyota quartet Kyle Busch, Matt Kenseth, Denny Hamlin, Martin Truex Jr.) surge into the lead. Five Chevys following them. 2:43 p.m.: Don't look now but Brad Keselowski has crept into the fifth spot. If he can catch up to his Ford friends, he could make a game of this for Penske. His teammate, the defending winner Logano, is still struggling behind in 18th place. Turn 4 has proved to be a trouble spot where many drivers report feeling their cars are feeling loose. Brian Vickers spun out there. 2:38 p.m.: Lap 73. Check out Jimmie. After being shunted to the back of the pack, he's now leading—with no friends around him, only Toyota cars. At this point in the race, though, he can leverage their eagerness to stay up front. 2:34 p.m.: Under green again. 65 laps in the can. Jimmie Johnson now in the lead followed by Denny Hamlin and Kyle Busch. One more thing: stay alert to the Stewart Haas cars. Kevin Harvick, who ran into some early trouble, is back up to 10th—right behind Kurt Busch. 2:29 p.m.: Still under our second caution of the day. 2:27 p.m.: The most surprising cars in that lead pack: the No. 43 of Aric Almirola and the No. 21 of Ryan Blaney. They're not natural teammates—Almirola drives for Petty Motorsports while Blaney is just starting his first full season running in the Cup series or the Wood Brothers. But they are Ford stablemates and are working well together so far. 2:26 p.m.: Brian Vickers' car seems to be unscathed. Not so for Carl Edwards...nice piece of driving by Dale Jr. to thread his way through the chaos. 2:24 p.m.: 57 laps. Second caution of the day after Brian Vickers in the 14, spins out on Turn 4, scattering the pigeons. Carl Edwards hit the wall while checking up. Vickers nicks Trevor Bayne as well. 2:20 p.m.: Track temperature is just over 100 degrees with light winds. Handling issues the big story so far. Dale Jr. has been battling them and reported that his pit box felt slippery, so a crewmember has doused the pavement with soda to make it stickier. High tech at work! 2:18 p.m.: 50 laps. We're single file now with the Toyotas pulling away and 10th-place runner Kurt Busch, in his Stewart-Haas Chevy, bringing up the rest of the lead pack. 2:13 p.m.: Lap 44. The top four cars on the bottom line are all Toyotas: Denny Hamlin (the race leader), Kyle Busch, Martin Truex Jr. and Matt Kenseth. The fact that the last two of those cars are backups (Truex, again, is on his third) speaks to the strides the manufacturer has made in power. 2:11 p.m.: Lap 40. Greg Biffle, running 11th, has complained of his car being loose and vibrating. Dale Jr. back in ninth with nowhere to go just yet. 2:08 p.m.: Lap 37. Jimmie Johnson, who had to start from the back of the pack after going to his replacement car, was running third behind Kyle Busch before trying to pass. He's been leading the top line, the grippiest so far. Denny Hamlin still in front. 2:03 p.m.: Lap 31. An additional note on Carl Edwards: it looks like he got grazed by Chase Elliott when the No. 24 got loose. 2:01 p.m.: After the re-start Denny Hamlin dueling with the Busches for the lead. Also overheard on Junior's radio: Elliott's camp radioed to say he got tight riding the middle lane. So the No. 88 car will pick it spots there, especially in these windy conditions. 1:59 p.m.: Lap 25. Ready to go back to green. Carl Edwards looks like his No. 19 Toyota has suffered a crack on the right front end. He's out of the pits now. We'll see if the crack winds up being a drag. Meanwhile, I just overheard this on Junior's radio: "This car feels real slick." Crew chief Greg Ives said he would address that, and Earnhardt's other report about high engine temperature, in the next pit cycle. 1:54 p.m.: Handling a major issue so far. Regan Smith (photo below) was also caught up in the Elliott incident. 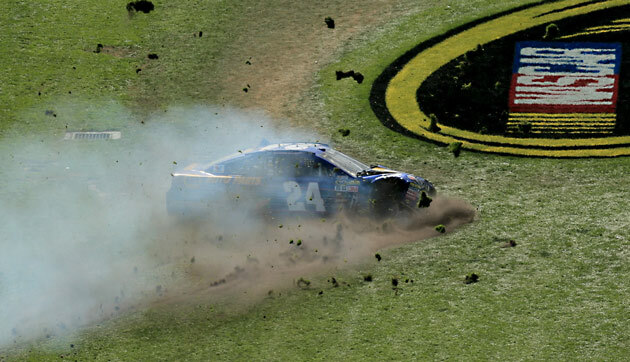 What's more, if the rookie hadn't skidded into the infield, which crumpled his front end, he might've been able to salvage the day. Instead, his promising start comes to an inauspicious end. 1:52 p.m.: More on Chase Elliott: He was riding in the middle lane by himself when his car got loose. He got out under his own power and is being taken to the infield car center. His incident brings out the first yellow of the race. 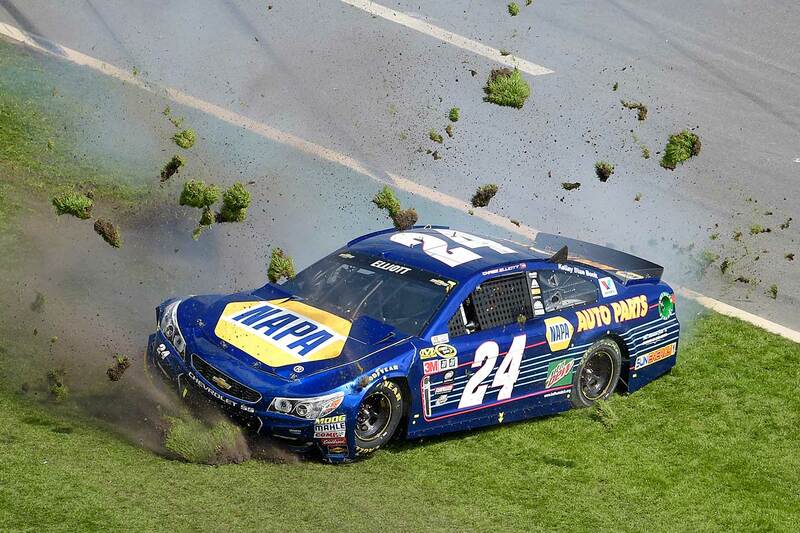 Chase Elliott's day comes to an unfortunate, early end. 1:50 p.m.: The Toyota cars are in parallel lanes now, with Kyle on the bottom—a groove no one has been able to make work so far. But as conditions change and the race wears on, that lane could get tackier. 1:47 p.m.: Austin Dillon struggling with his car's handling, dropping back to 39th...Kevin Harvick careers below the yellow line, but recovers nicely...Double disaster: Just as Harvick loses the draft and positioning behind Kyle Busch, Chase Elliott spins off the track. He's spinning his wheels in the infield now. His car is pretty beat up. His race looks to be over. The tow truck is on the scene. 1:42 p.m: We've gone 10 laps. 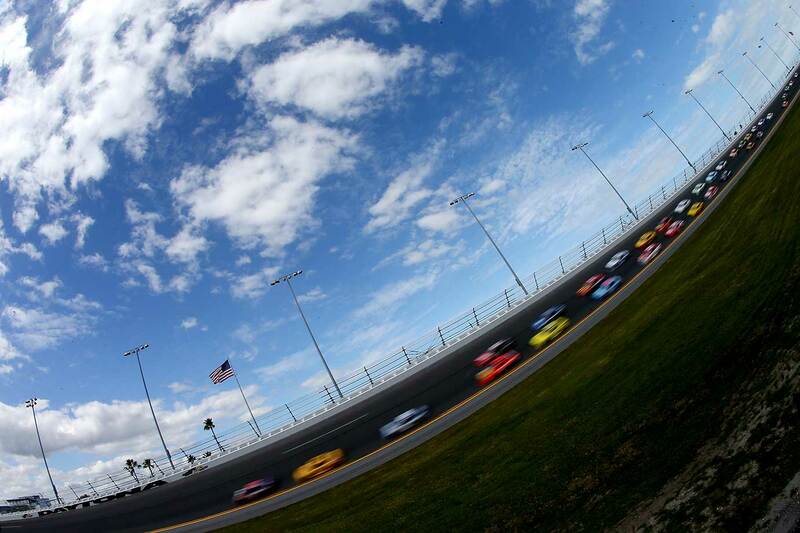 Dale Jr. is still in front, but who knows for how much longer? Joey Logano is sitting between him and Chase Elliott on the top line, while the Toyotas (Denny Hamlin and Kyle Busch) mount their own charge on the bottom groove. 1:37 p.m.: Dale Jr. elicits a roar by surging into the lead after three laps. Denny Hamlin and Joey Logano in hot pursuit. Through the first four laps, we've seen four rows of two-by-two and three of three-by three and our first lead change as the pole sitter Chase Elliott yielded to his pusher Dale Jr.
1:33 p.m.: And we're underway ... A note on pitting: The fuel window for this race is between 35 and 40 laps. The pit road speed is 55 miles per hour. 1:19 p.m.: Grand Marshal Gerard Butler has given the command. 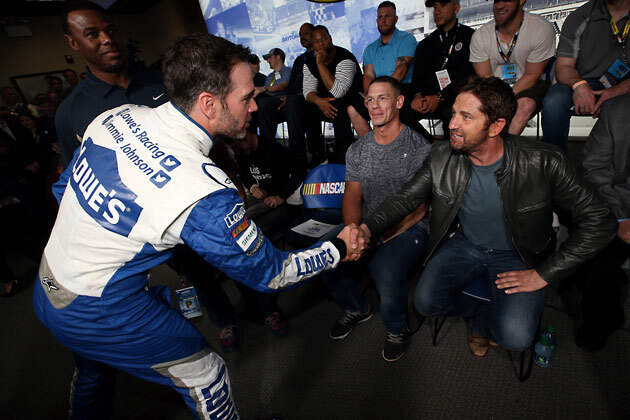 Jimmie Johnson greets Grand Marshal Gerard Butler. ​12:39 p.m.: Fifteen years ago this week, on the last lap of the biggest race of the NASCAR season, a black Chevy bearing the iconic No. 3 made a hard right turn into the wall and the brightest light in the sport was extinguished. The death of Dale Earnhardt Sr. still resonates—in the physical changes made to tracks across the country in the name of safety, in the hearts of the drivers he spurred and inspired, in the spirit of NASCAR itself. In remembrance of one of biggest legends in sport (and while we wait for the command), here's one of the best pieces you'll ever read on the Intimidator by my forebearer on the motorsports beat, the incomparable Ed Hinton. The pre-race flyover on a beautiful day. 12:18 p.m.: The kind folks at NASCAR were nice enough to hook me up with a FanVision controller, a smartphone-sized contraption that makes race days a Clockwork Orange-type of experience. Along with streaming live video and providing up to the second stats, it can eavesdrop on up to three radio channels of the drivers in the field. The game plan is to start out with Joey Logano (the defending 500 winner), Kyle Busch (the defending Sprint Cup series champion) and Chase Elliott (the pole sitter). Fine print: That lineup is subject to change depending on the flow of the race and your feedback. So if there's another car that is in line you'd like me to tap, let me know. Noon: Every TV drama starts with a recap. 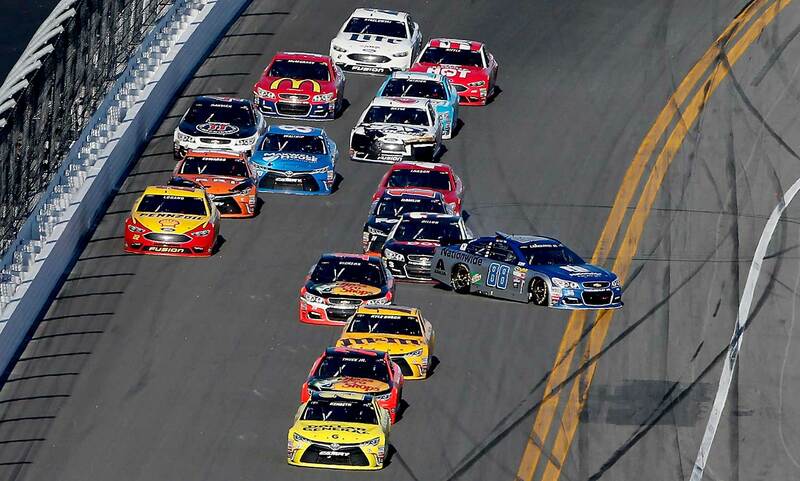 So, last year, in the Daytona 500: Jeff Gordon landed on pole in his last start and led a race-high 87 laps only to be ultimately overtaken by Joey Logano—who held on to his nerves through a long red flag and then held off Kevin Harvick and Dale Earnhardt Jr. on the way to capturing the checkered flag. 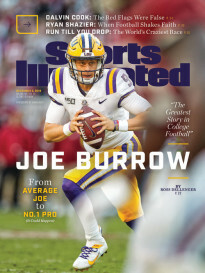 To read more all about that, check out the recap I wrote for SPORTS ILLUSTRATED magazine last year. • The Joe Gibbs Racing cars. There are four: the No. 18 of defending Cup champion Kyle Busch, the No. 11 of Denny Hamlin, the No. 19 of Carl Edwards and the No. 20 of Matt Kenseth. The quartet has been wicked fast all week. Kenseth, though, will start on the front row next to Elliott, and then move to the back of the pack because he had to switch to a backup car after wrecking his primary car beyond repair in Thursday night's Can-Am race. But don't count him out. Because of his strong qualifying position, he was granted second dibs at a prime pit stall—at the very end of the lane, right by the entrance, which give his team the first crack at making necessary repairs. 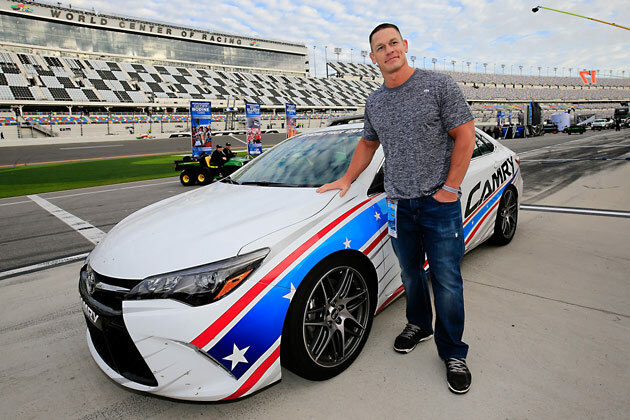 ​Oh, almost forgot to mention the celebrities who are actually working today: Cena will drive the pace car. Actor Gerard Butler (late of London Has Fallen) is our Grand Marshall, and the Hall of Fame outfielder Ken Griffey Jr. is our honorary starter. 11:30 a.m.: Greetings from Daytona International Speedway, where it‘s 76 degrees and sunny. Perfect racing weather. Here's the starting grid.